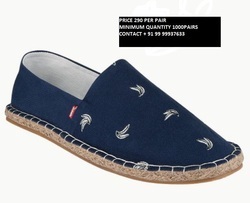 Leading Exporter of fashionable latest espadrilles shoes from New Delhi. Men’s Espadrilles. ... The robust rubber outsole, jute sidelining and faux suede finish foot wear last long beyond this summer. ... Light weighed casual shoes have raised the style quotient for men.